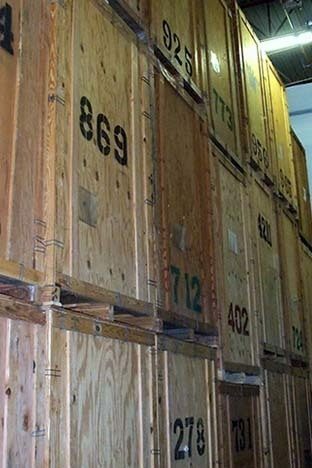 Piepho Moving & Storage has been in the business of keeping customers happy and belongings safe for over six decades. We’re your local Allied Van Lines agent. Mankato Movers. Full service residential and corporate moving and storage. 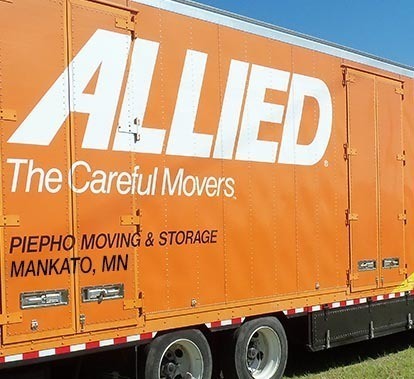 Piepho Moving & Storage is your local agent for Allied Van Lines serving Mankato, Minnesota and all of southwestern MN. Our Mankato moving crews have the experience and dedication to customer service you want at a price that will make you smile. Fits Your Budget — We'll help you create a move that keeps you on budget. Perhaps we move the piano, the heavy furniture and the fragile china. Or maybe you want to save time and keep your back happy and we'll take care of everything. With Piepho, you've got options. 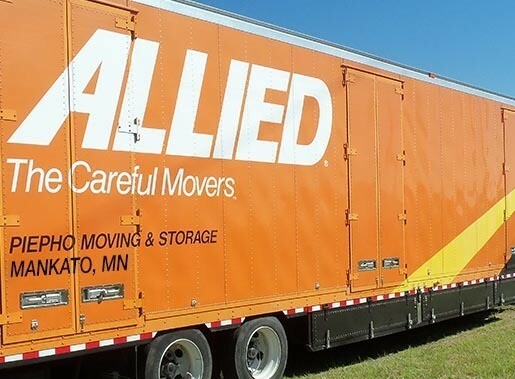 Customer Satisfaction — Whether you need our Mankato movers to take a bedroom set to Blue Earth, MN; or your entire household moved to New Ulm, MN, Piepho Moving & Storage will provide complete customer satisfaction. Member Of Your Community — Piepho Moving & Storage has been a premier southwestern Minnesota moving services provider since we opened our Mankato moving office and storage facility in 1975. Serving Mankato, Owatonna, Albert Lea, Fairmont, New Ulm, St. Peter, Gaylord, Janesville, Waseca, Faribault, and the rest of southern Minnesota. See Our Review — Piepho Moving and Storage is so proud of our reviews and overall customer service & satisfaction, let us know what you think! We're your local Mankato movers with national and international reach. 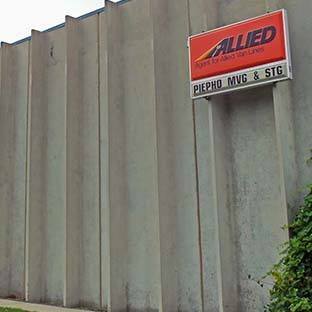 As an agent for Allied Van Lines, we have a network of nearly 500 Allied Van Lines agents across the United States and around the world. We can personally help you with your relocation everywhere you need to go. In-home Estimators — Our knowledgeable estimators will come to your apartment or house and discuss your moving needs. We will explain how moving charges are calculated to ensure you are comfortable with the moving process. Our accurate in-home estimates provide greater peace of mind as you prepare for your move. We never ask for a deposit or down payment to book your move with us. Guaranteed Delivery Window — Most long distance shipments booked through Piepho Moving & Storage have guaranteed delivery windows. If your shipment is delayed, you will be compensated for the inconvenience. Specialized Long Distance Relocation Coordinator — Your Mankato moving coordinator helps you plan your move from start to finish, from the initial estimate until you’re boxes are unpacked at your new residence. 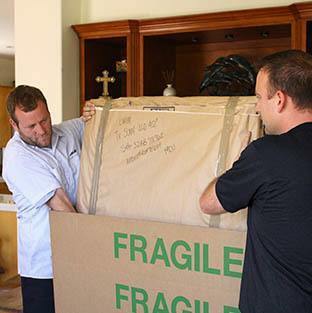 Piepho Moving & Storage relocation coordinators are known to reduce stress, and lighten your workload. Reach Your Coordinator and Driver Anytime — You will have direct phone numbers to your driver and coordinator so you can always stay up to date on the progress of your household items. Track Your Truck — Want to know where your belongings are after the truck leaves? 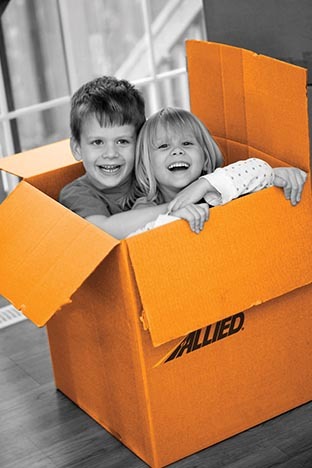 You can track your belongings using Allied Van Lines online shipment tracking service. Are you building a new home in southwestern MN and need a safe place to store your possessions? Or are you running out of room for your items in your closets and utility room? Piepho Moving & Storage’s Mankato storage facility is ready to safely and economically store your belongings. 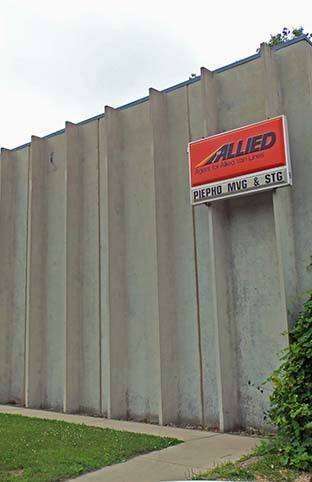 Secure Storage — All visitors to the Piepho Moving & Storage warehouse are escorted by one of our background-checked employees, keeping your household goods safe. 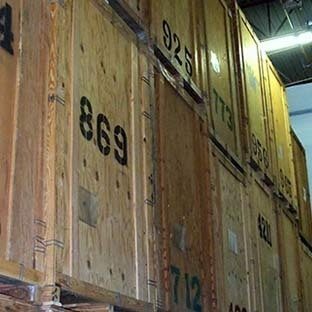 Pristine Condition — The Piepho Moving & Storage warehouse is climate controlled to keep your possessions in tip top shape. 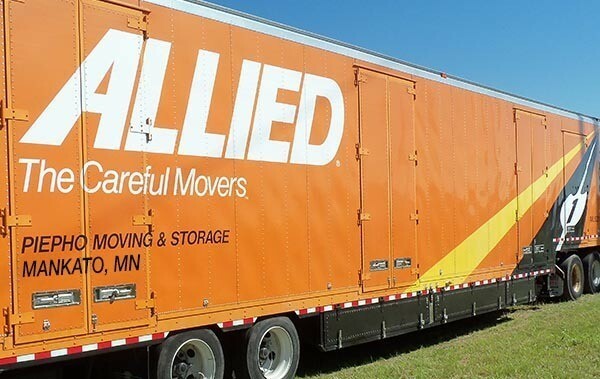 Continuing Coverage — When you have valuation through Allied Van Lines, your belongings are covered in our Mankato warehouse. Piepho Moving & Storage has all the moving boxes and packing supplies you need to prepare for your move. Would you rather have our packing experts pack your boxes for you? Our Mankato corporate relocation team works with companies in Blue Earth County and the entire Southwestern Minnesota area to provide the best possible moving services for employees like yours. Our experienced Mankato moving teams understand your employees will move on tight timeframes and need prompt and careful service. We work to put your employees' minds at ease and allow them to focus on their family and work while we take care of the heavy lifting. Free valuation coverage for most moves. Last minute scheduling ability, even during our busy summer months. We keep our Mankato moving teams available for you when you need us. Mortgage and realty assistance thanks to our partnership with Allied Van Lines SIRVA. Piepho Moving & Storage knows that when you need to move your business or office, you need an expert moving team that will minimize the impact on your operations. Our Mankato moving teams will work outside your business hours to keep you up and running. Our crews have experience carefully and quickly moving offices, schools, medical equipment, and other professional items. Precise Estimates — Our experienced estimator visits your business and designs a move that works within your budget and schedule. Dedicated Move Manager — Our Mankato moving managers oversee every aspect of your move, and are there to help you troubleshoot any time of day or night. Experienced Office Equipment Packers — We have professional movers who are well-versed in the art of taking apart office furnishings when necessary, and re-assembling upon delivery. Our experienced packers know how to protect your investment in fragile equipment such as computers, copy machines, phone systems, and more. Secure Convenient Storage — Our Mankato storage facility can receive your new office furnishings and deliver them on your schedule. 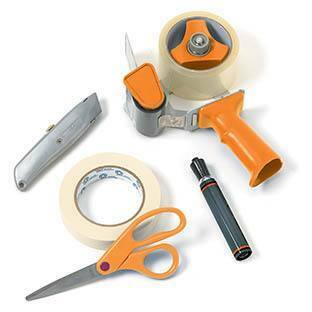 Or, if your new space isn’t ready when you need to move, we can store your items until your new office is prepared. Is your company running out of storerooms and supply closets to file your documents? Then turn to your local Mankato, MN Piepho Moving & Storage facility. We built it to withstand nearly any natural disaster to keep your important records safe and secure. You can easily reach the Piepho warehouse facility from New Ulm, MN; Eagle Lake, MN; St. Peter, MN; and the surrounding southwestern MN area. Our warehouse is climate and humidity controlled to keep your records in great shape for the long run. Piepho Moving & Storage was recently honored with the Apex Award. This prestigious award is only earned by a handful of Allied Agents nationwide who have earned "Excellent" ratings in customer service for at least ten consecutive years. As a family-owned and run business, our name is on every truck and all of our storage warehouses. Our family reputation is on the line with every move we make. That means that we go above and beyond to not only meet our family's high standards, but to exceed your expectations. Why do we do free in-home estimates? When our experienced estimators personally review your moving needs, we can give you the best, most affordable pricing customized for your particular move. If you receive a comparable quote for less, we'll beat it. We never ask for deposits or down-payments to secure your move with Piepho. Call for your free estimate today. Serving: Mankato, Owatonna, Albert Lea, Fairmont, New Ulm, St. Peter, Gaylord, Janesville, Waseca, Faribault, and the rest of southern Minnesota.